Muda : The system isn´t perfect, is that the real issue? The system isn´t perfect, is that the real issue? I`m back writing again, after a very long period of inactivity. But it has been for good, as I have been learning and fine tuning my Lean skills. 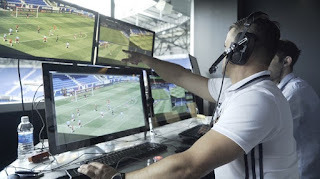 Today I want to write about the Confederations Cup and the new system that it´s being used to help referees make tough decisions; the so called VAR. In Soccer, there are 4 referees, that basically rely on their own eyes, experience and interpretation of the rules to take the calls. Soccer is one of those sports that seem to have been away from technology for a long time. It´s no surprise that, as referees rely on their abilities to have a fair performance every game. However Soccer is the one sport that has many periods of controversy, precisely because the decisions referees often make, are completely wrong. There are famous examples as Maradona´s "Hand of god" in 1986 World Cup, or the "Phantom Goal" that gave England its only World Cup title in 1966. Most recently Thierry Henry´s hand during the World Cup qualification in 2009, in a match between France and Ireland. Henry controled the ball with the hand (something totally forbidden in Soccer) and gave an assistance to a team mate, who scored a Goal, and because of that Goal, Ireland was out of the World Cup. So, as you can see, Soccer´s needed desperately for years a better technology, rules, a better system to make the game fair for both teams. NFL has Video Assistance and challenges, where teams can request referees to look again at the critical plays and this, often allows referees to take accurate decisions. NBA has a similar system and very clear rules. Soccer has integrated a similar system to try to help referees to make better decisions. This new system/technology is called VAR (Video Assistant Referee) which is basically something very similar to what the NFL has. This summer, the tournament called Confederations Cup is being played in Rusia. One year before the World Cup that will be played at that same country. In this tournament, the VAR has made its debut. And as expected, there are complains from analysts and public in general. Why? Because in order for the referee to take a look at the VAR, the game needs to be stopped. Fans, players, coaches and tv analysts aren´t used to the this. Soccer is a sport where the only time it is stopped is when there is an injured player, somebody scores a goal or there is an external situation. So it is logical that there are many complains about this system. Perhaps, the fact that the game has been stopped for over 2 minutes, is a main contributor for the complains. The main complain is that it interrupts the game. Some said, that the promise was that it wouldn´t take more than 30 secs to review a controversial play. VAR system provides feedback to referees when critical plays arise. All this made me think about the "resistance to change" when a transformation or a new process or perhaps, a new technology is being introduced at any process. There is always people who will resist the change. Why? There are a lot of reasons. Not fully understanding why the change is needed, is one common. Because often, technology isn´t reliable and brings more troubles than solutions. Because the change is imposed and people often insn´t taken into consideration when introducing change. Because leadership isn´t commited to change and there is poor follow up on initiatives, etc. There are a lot of reasons why people seem to resist to change. In the case of Soccer, this new technology isn´t as efficient, as I believe could be. But at least, is based in a system that has proven to be efficient. The NFL, I think is an example that Soccer should persuit. And the fact that now, 2 minutes or more are needed to review a critical play, isn´t necesarily bad. My expectaton is that this system will continue to evolve to achieve that 30 seconds promise to review a play and make a decision. Or even less time. We should not forget, that everything can in fact, be improved. And the fact that right now, this process is a bit longer, doesn´t mean it cannot go faster and be more accurate and better in the future. I really think that a system that isn´t perfect is not a abad thing, as long as the owner recognize the flaws and would be willing to fix it. A really bad thing is when a process is launched, has many flaws and the owner doesn´t seem to be interested on improving. Resistance to change will always exist. Or perhaps we better call it, Not understanding the change. In life as in processes will always be people who prefer the old way. I guess we can keep trying, use our minds to explain the better possible way why it is important to follow change. And what benefits can arise from the change. Usually when people gets it, they get it. Listening to the suggestions of people is always a key element to overcome fear or lack of understanding. In the end Lean is about making things better, WITH people. So, VAR creators have a great opportunity to listen, observe and improve the system for the sport´s, fans and media benefit. Only time will tale if these creators have a continuous improvement mind set or not. The main issue is not that the VAR isn´t perfect. The issue is wether VAR creators would be able to recognize the flaws and improve the system. Thanks for reading, would love to read your thoughts regarding Soccer, change or else.